On May 8, U.S. President Donald Trump announced his decision to “exit the Iran deal”. Three days later, a new freight train service connecting China and Iran became operational — another milestone in the development of Sino-Iranian relations, achieved at the very time that Washington was gearing up to pressure foreign companies to wind down their business dealings with Iran. Over the years, China and Iran have developed a multidimensional partnership. Although cooperation in the oil and gas sectors has long been the central pillar of the relationship, bilateral economic ties have become increasingly extensive. Close cooperation between Beijing and Tehran is also evident at the political level, driven partly by their convergent interests in geostrategic balancing against the United States. Indeed, China has emerged as Iran’s leading trade partner, the largest importer of Iranian oil, and Tehran’s closest political ally. In conducting its relations with Iran, though, China has had to balance multiple competing regional and global economic and strategic interests. The dispute over the Iranian nuclear programme posed a particularly difficult challenge for China. Nevertheless, Beijing executed its policies skilfully: supporting nuclear-related sanctions against Iran while deftly circumventing some of their restrictions, and playing a valuable mediatory role during the many months of negotiations leading to the Joint Comprehensive Plan of Action (JCPOA). However, with the recent decision by the Trump administration to withdraw from the JCPOA, the bright prospects for a “new chapter” in Sino-Iranian relations appear to have darkened. U.S. Secretary of State Mike Pompeo’s May 21 speech, in which he vowed that the United States would “apply unprecedented financial pressure on the Iranian regime” could well have been the prelude to a new testing time for Beijing. China hailed the January 16, 2016 implementation of the JCPOA as an important diplomatic breakthrough. With President Xi Jinping’s arrival in Tehran for a state visit less than a week later, China moved quickly to capitalize on the relaxation of sanctions. The visit culminated in the signing of 17 bilateral agreements, the setting of ambitious trade targets, and the establishment of a “comprehensive strategic partnership”. In 2017, Sino-Iranian trade reached $37.18 billion, 13% higher than the previous year. The state-owned China National Petroleum Corporation (CNPC) secured a 30% stake with French consortium partner Total in a project to develop phase 11 of Iran’s South Pars gas field. Additionally, China signed a $10 billion financing deal to support projects in Iran. However, the Trump administration’s withdrawal from the JCPOA has placed these gains at risk. China’s initial response to the U.S. decision was measured yet firm. The Chinese Foreign Ministry signalled that it did not support the U.S. decision to quit the deal, but stopped short of criticizing any specific country. Still, Chinese Foreign Ministry spokesman Geng Shuang subsequently made clear that Beijing intended to “continue with [its] normal and transparent practical co-operation with Iran on the basis of not violating [its] international obligations and was opposed to the imposition of unilateral sanctions “and so-called long-arm jurisdiction by any country”.Predictably, Iranian officials called upon China to preserve the nuclear agreement. At Beijing’s invitation, Iranian Foreign Minister Mhd. Javad Zarif met with his Chinese counterpart Wang Yi as part of a diplomatic tour aimed at preventing the deal’s total collapse. Accompanying Zarif was a senior official of the National Iranian Oil Company (NIOC), seeking assurances from Sinopec and Zhuhai Zhenrong executives that the level of Chinese oil purchases — accounting for a quarter of Iran’s total production — would be maintained after U.S. sanctions take effect. For the second time in less than a decade, China faces difficult choices. But this time is different from the first, in several respects. Firstly, intra-regional rifts have widened, and tensions have risen. Israel, Saudi Arabia and the United Arab Emirates (UAE), emboldened by the Trump administration, have become more assertive. As a consequence, the risk of even greater regional instability and conflict has grown. Secondly, China and the United States are currently engaged in a high-stakes struggle over bilateral trade-related and maritime security issues within a broader climate of mounting mutual mistrust. Thirdly, the 19thParty Congress and First Plenary Session of the 19thCentral Committee cemented Xi Xinping’s dominance, heralding a new era in Chinese politics while reinforcing the conceptual shift under Xi’s leadership away from Deng Xiaoping’s foreign policy dictum of “keeping a low profile”. Fourthly and related, the Belt and Road Initiative (BRI) has evolved into a massive program with a “mission explicitly to support China’s geopolitical strategies” in which Iran is expected to play an integral role. Fifthly, the U.S. decision to walk away from the JCPOA has shattered Western solidarity regarding Iran while causing China’s position (and Russia’s) to converge with those of Washington’s traditional allies. Accede to U.S. pressure to renew sanctions in the (unlikely) event that an international consensus in favour of such action emerges, resistance to it falters or Iran counters by resuming work on its nuclear program. Defy the United States by seeking to “fill the vacuum” created by foreign firms’ retreat from Iran and/or by offering to serve as an intermediary for European and other companies willing to continue doing business with Iran. Evade sanctions in instances where Chinese companies with business in Iran have U.S. exposure, by employing workarounds, such as the creation of new subsidiaries or other special purpose vehicles, the redirection of trade with Iran through third countries, and/or the use of yuan-denominated transactions. Three considerations would seem to favour China’s adoption of a cautious, restrained approach. Firstly, Iran needs China more than the other way around. In 2017, China’s trade with Iran accounted for less than 1% of its estimated $4.28 trillion total trade. Furthermore, China can absorb the disruption of Iranian oil supplies, which is not irreplaceable, as crude imports from Russia and Saudi Arabia could be augmented to offset losses of Iranian supplies. Secondly, China’s economic relationship with the United States is vastly more important than that with Iran. In 2017, China’s bilateral trade with the United States stood at an estimated $636 billion, 17 times higher than the volume of trade between Iran and China. Thirdly, China’s desire to safeguard its broader economic interests and concern for its international reputation constitute powerful incentives for Beijing to bandwagon with the allies that Washington has spurned in order to salvage the deal. In the short term, Beijing can be expected to employ “constructive” diplomacy in support of efforts to forge a united front to resist sanctions. For China, the first real test could come in November, when Total might be forced to withdraw from its South Pars joint venture, presenting an opportunity for the state-owned China National Petroleum Corporation (CNPC) to take over the French stake — a temptation difficult to resist. 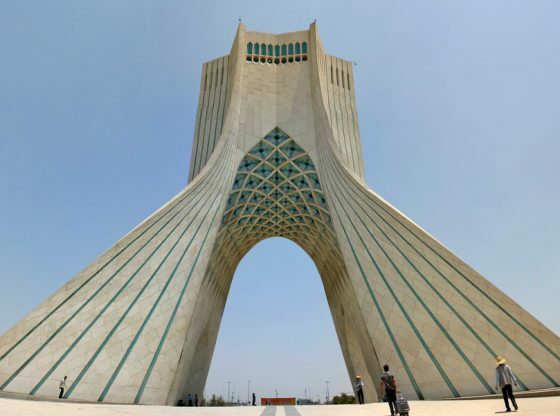 Meanwhile, under the new sanctions regime, Iran could find itself more dependent than ever on the Chinese market without being substantially better positioned to fulfil its development needs and objectives. Dr John Calabrese teaches US foreign policy at American University in Washington, DC. He also serves as a Scholar in Residence at the Middle East Institute where he is directing MEI’s project on The Middle East and Asia (MAP). Image Credit: CC by Christiaan Triebert/Flickr.